Halloween fun isn’t limited to just the sweet stuff! 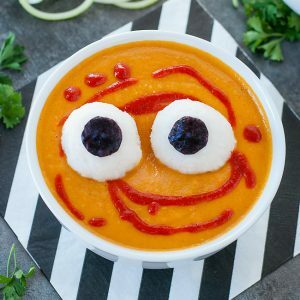 Sneak some veggies into your Halloween shenanigans with this Spooky Halloween Monster Mash Soup! If you happened to see yesterday’s post, then you know I’m having way too much fun playing with my food. I’ve resisted Halloweenifying my eats for years, but now that the chickpea is here and uber obsessed with celebrating #ALLTHEHOLIDAYS, I totally gave in. You won’t find any franken-foods here, however. We’re spookifying clean eats and giving their sugary counterparts a run for their money! Snag your favorite soup recipe for this one, or use a few tasty options from the Peas and Crayons arsenal to put the YUM in monster mash! That made zero sense… I need coffee. 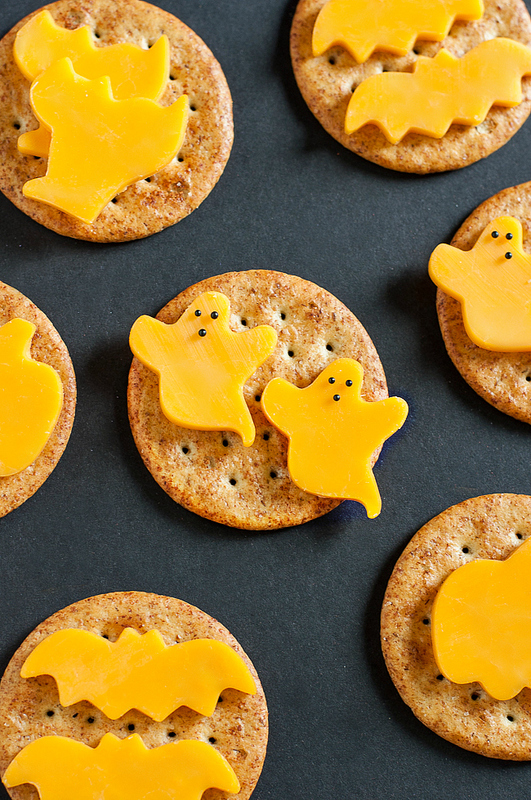 Your BOOS will love this spooky soup! Gloriously customizable, you can make enough soup for a crowd or simply for two. Simply adjust the amount of rice you make and you're good to go! Greek yogurt or sour cream can be drizzled on the soup in addition to or instead of the Sriracha this comes in handy if you're serving kiddos! Heat up your soup via stove-top or microwave, whichever is preferred. Rinse sushi rice in a strainer until water runs clear. In a medium pot, add uncooked rice to water and bring to a rolling boil. Reduce heat to lowest setting and cover, cooking rice for 20 minutes. While the rice cooks cut your nori into circles with a pair of kitchen scissors. Once rice is ready and perfectly fluffy/soft, fluff with a fork and transfer to a bowl to cool enough to handle. Scoop small portions of rice into the palm of your hand and squeeze gently. Roll each portion into a ball and place your seaweed circle in the center. To help support the eyeballs, flip a small ramekin or dip bowl upside down in the center of your soup bowl before adding the soup. The small bowl will act as an invisible shelf if needed. If you're using zucchini noodles in the soup you can skip the mini bowl, since they'll offer enough support on their own. Drizzle with Sriracha [skip this spicy topping if serving the soup to kids] and set your eyeballs on top of the soup. I used my Roasted Carrot and Sweet Potato Soup Recipe as the base and topped it with a hearty drizzle of Sriracha. It was ridiculously delicious!Nearly any fall soup can be used, even pumpkin! The utterly awesome thing about this recipe is that you can essentially spookify any soup you’d like! 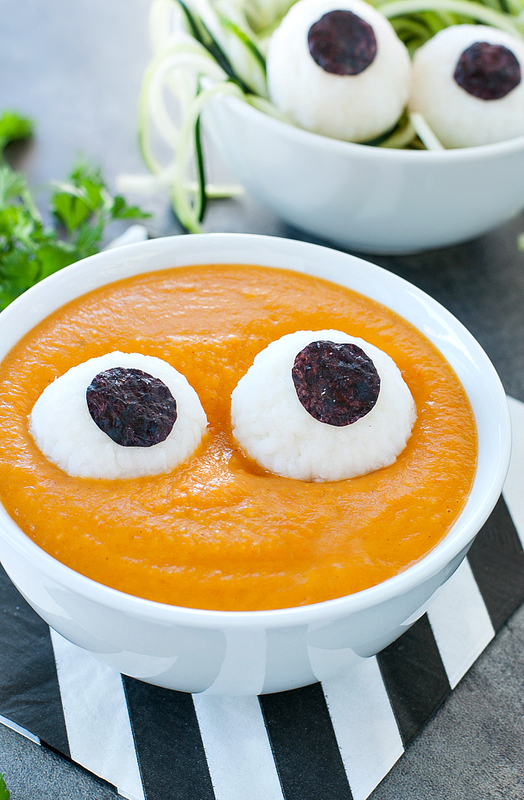 Tomato, pumpkin, sweet potato and squash soups galore, they’ll all work gloriously with a set of creepy peepers thrown into the mix! Even a store bought soup would work in a pinch. Wondering what that squiggly business going on in the background of the first photo is? Only the most awesome excuse to add extra veggies to your meal! 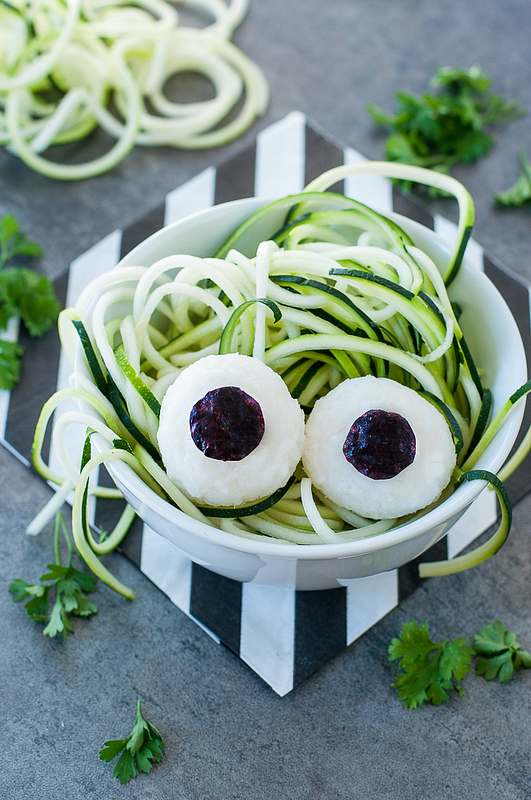 How stinkin cute are these spooky spiralized zucchini noodles!? You can actually add them to your eyeball soup (try this recipe for the soup base – AMAZING!) or serve them up spaghetti-style with a mountain of sauce. Ooooor while we’re at it, turn it into a spooky side salad with a side of dressing. There are literally a million billion ways to let veggies in on the Halloween shenanigans, try it! If you get a chance to try this spooky Halloween monster mash soup, let me know! Leave some love in the comment form below or tag your photos with @peasandcrayons on Instagram so I can happy dance over your creation! My kids freaked over this soup! So much fun! 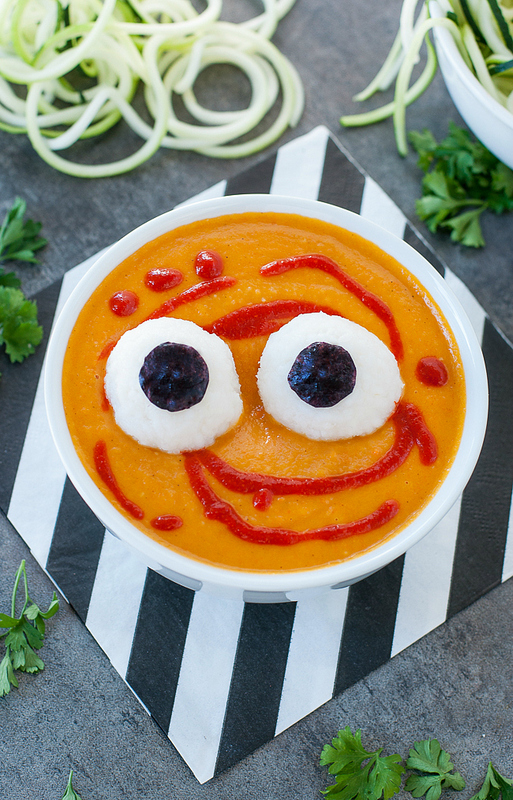 This monster mash soup is such a cute idea for Halloween! My kids are going to love it! This is awesome! I am planning on making it for this coming Halloween. One question: do you think these would make ahead well, perhaps a day in advance? Hey Laura, thanks! Absolutely make the soup and even the zoodles in advance! I would keep the zucchini noodles in a baggie with the air pressed out in the fridge and then just keep the soup separate in whatever containers you have on hand (the soup will keep up to 4 days total) The rice eyeballs will be a bit trickier since rice tends to dry out when made ahead of time so maybe store the rice balls with a damp paper towel in the container (also pop it in the fridge) and then leave the seaweed pupils til before serving because those kind of get wonky. But you can have those cut and prepared and ready to go so all you’ll be doing is reheating and tossing it all together 🙂 Hope y’all have a Happy Halloween! I love adding googley eyes to your soup! Great idea! So much fun! This is so cute!! ;) And with Sriracha, I know it will be a hit with many! You’re like a magical wizard at making healthy foods look adorable and child friendly 🙂 My little one will go crazy for this! Bahaha thanks Leah! Hope you guys love it! My 2 year old kept squealing PEEK A BOO!!! at the soup and laughing like a maniac.